What can I say about Lili? She’s funny, stubborn, beautiful, smart, independent, curious and entertaining. Here are some of the newer things she is saying and doing these days. Opening up conversation about things in the future only opens the door to OCD. One morning I brought up the subject of her going to pre-school next year. That turned into daily conversations about “My cool (school)” and “I cited (excited) about my cool (school)” which turned into pointing to the neighbor’s garage and telling us that was her school. Not sure where that one came from. Talking about getting on an airplane and going to get Naomi was a daily conversation and came up multiple times during the day. The latest has been discussion about going to Farm Park. Farm Park is exactly what it sounds like – a park full of farm animals. It is about 1/2 an hour from our house and we’ve been there a couple times with friends. Lili wants to go to Farm Park and I had to explain to her that we can’t go to Farm Park until the snow melts, after Naomi comes home and the weather gets warmer. Almost every morning the first thing she tells me is that we will go to Farm Park when the snow is gone. She typically tells me 2 or 3 more times during the day. Basically, we have daily conversations now about her school, going to pick up Naomi and Farm Park. I introduced Lili to a couple games recently. Unfortunately, the concept of taking turns when playing games is beyond understanding at times, but there is a glimmer of hope that she’ll not only be good at playing games, but will also enjoy them. Coloring, play-doh, and puzzles are still very much favorite activities, but a new favorite has joined the line-up. Lego’s! And not the big Duplo type Lego’s, but the little Lego’s. That is going to be a bit of a challenge with Naomi comes home, but we’ll work it out. Lili still loves books and has graduated to wanting to read her books to us. It’s so, so, so cute and I really need to get it on video. Helping mommy is a lot of fun. She loves to take clothes from the washer and put them in the dryer or hand me clothes from the dryer to fold. Dusting is probably her favorite chore though and she gets upset if she doesn’t have her own dust cloth. Now, if I could just get her to love cleaning bathrooms I’d have it made. The independent part of Lili wants to do things all by herself and we hear, “I do it all byself,” often. By-the-way, that is how she says it. Not allowing her to be independent can also cause a major meltdown. For example, she wants to brush her own teeth, but doesn’t do the best job. If mommy takes over the toothbrush WWIII breaks out. Ah, the joys of parenting!!! Lili has really turned into a little social butterfly over the last few months. For the first 1 1/2 years after arriving, home she was very timid around people she didn’t know or didn’t know well. It was common for her to hide her face when someone greeted her. Suddenly the caterpillar emerged from her cocoon and more times than not she greets people before they even know she’s in the door. I can’t even count the number of times she has made someone smile with just a quick wave and a ‘hi’ as we’re going through a store. She still has her moments of hiding, but they are much fewer and further between now. The camera she got for Christmas continues to be a hit. She has also figured out how to use the video function on the camera and quickly runs out of storage space on the camera as a result. That’s just a quick update on Lili and now here are some recent photos of our funny, stubborn, beautiful, smart, independent, curious and entertaining little girl. 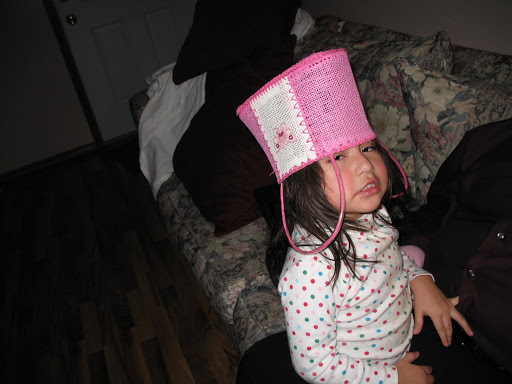 She loves using various things as hats. 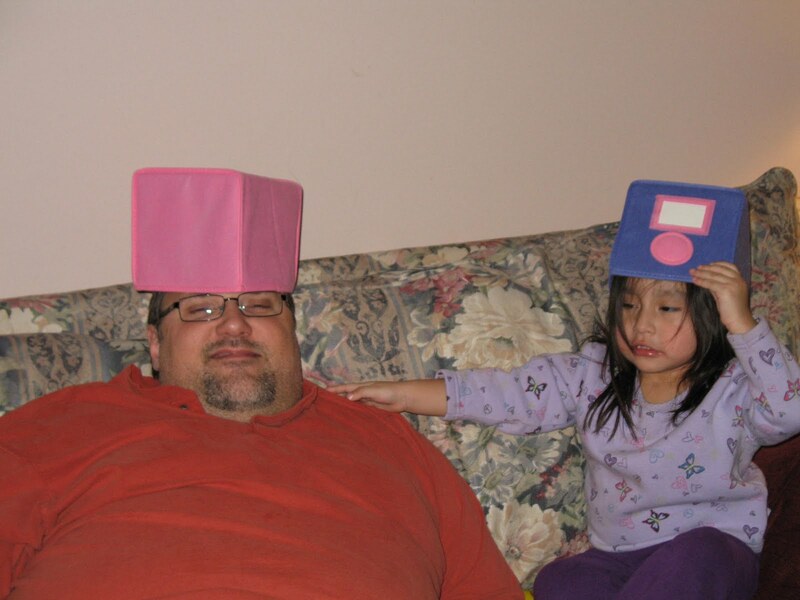 And has a daddy that is a good sport about playing along. 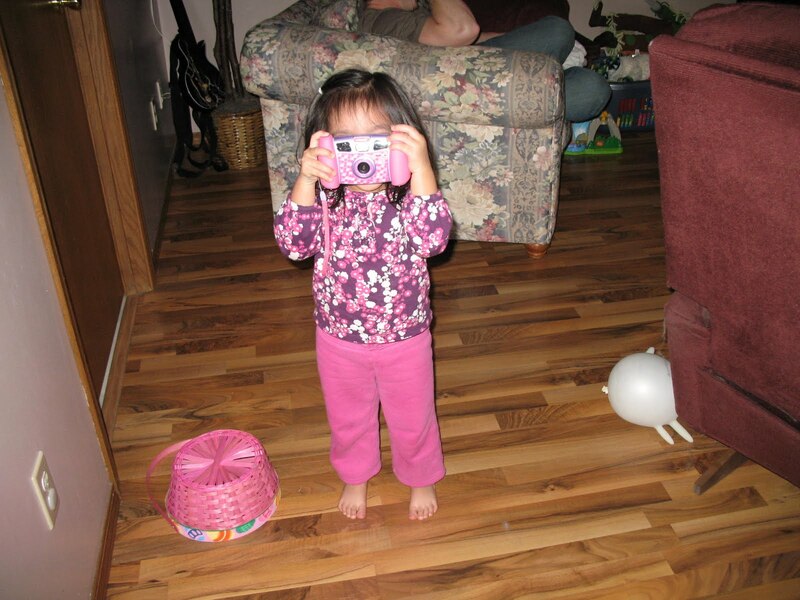 Lili thinks it’s great fun taking pictures of each other taking pictures. And that is a rubber glove balloon on the floor next to her. 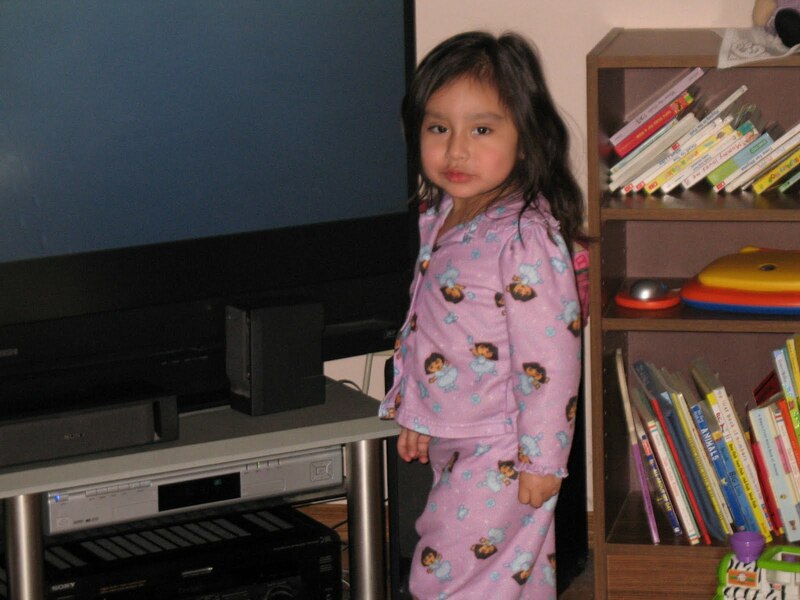 A quick pose in her Dora pajamas. Hope you enjoyed the Lili update. Have to say that Lili updates are the best part of my days. Can't wait to see both of you on Saturday. I wondered if the OCD was just Grace or normal 2 year old. Are you all packed yet?